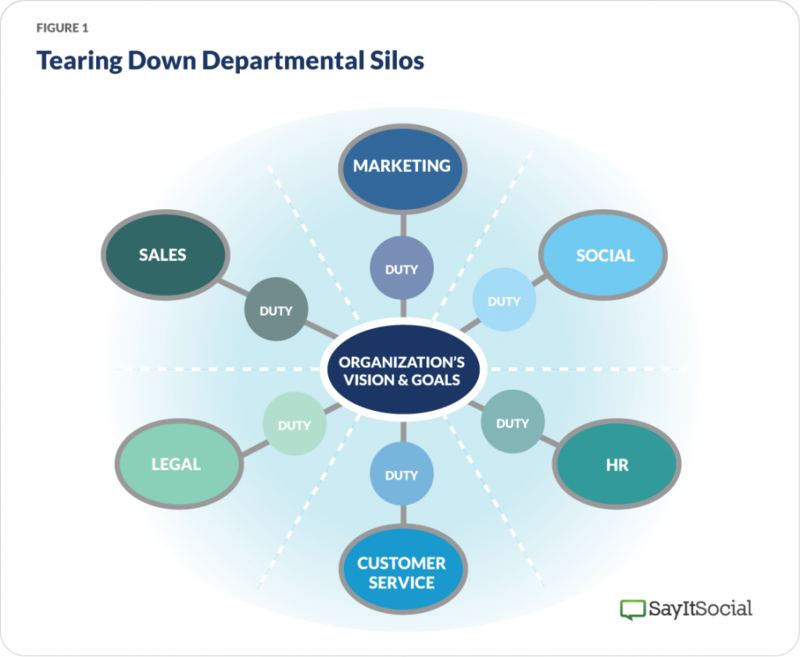 An overwhelming advantage of a fully operating Social Business is the nonexistence of departmental silos. Systems, policies and protocols are put in place to emit a strong transparency between entire departments of global organizations. Tones of voice, both short and long term social media goals and even content strategy are aligned with the overarching bottom-line objective of the business. What we increasingly discover, while auditing organizations’ social media marketing practices, is the lack of transparency, collaboration and alignment between these departments – ultimately forming company-wide silos. Illustrated in Fig. 1, comprehensive social business training should offer a laser-focused approach tearing down such silos; to encompass all departments with a unified vision and goal. This in turn should promote a transparent approach to support a ‘Our Organization’ over a ‘My Department’ mentality. A detailed and tailored strategy includes the integration of social technologies into all aspects of communications, developing a shared vision and goal between a multitude of departments that fit into the broader scope of corporate strategy while also providing extensive social media and management systems training to align all levels’ ability and focus. If you found value in this, we would love to hear your thoughts below!